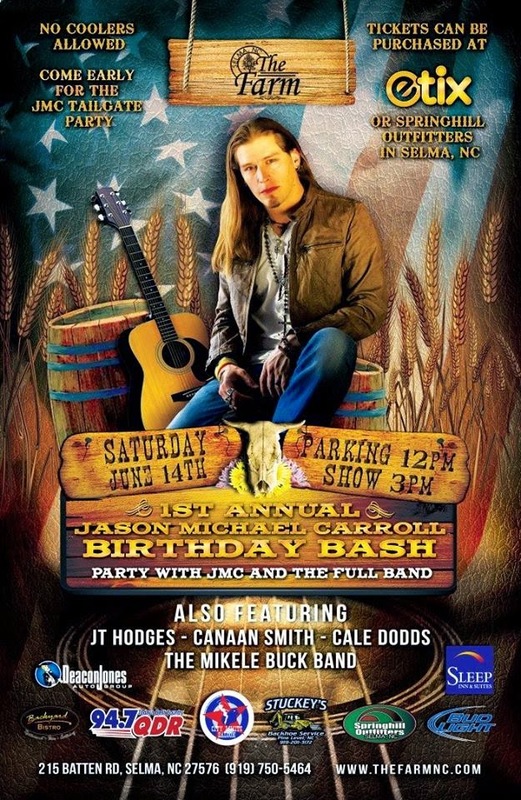 We're excited about celebrating Jason Michael Carroll's birthday with him this weekend in Selma, NC and hope to see a ton of his Honky Tonk Friends on hand to help him say hello to another year! Come out to The Farm on Saturday June 14, 2014 and celebrate with us and with his friends JT Hodges, Canaan Smith, Cale Dodds and Mikele Buck Band. Tickets are still on sale and reminder that this is an outdoor venue with general admission seating so get there early and come prepared for the NC summer heat! This is going to be a very full day of great music including a parking lot show by Jason. Tickets are on sale now at etix.com or at Springhill Outfitters in Selma, NC. NOTE: You can save $5 and get tickets through Friday night at midnight. Tickets will be sold at the gate Saturday for $24.50 instead of $19.50!! Anthony and I will be in the photo pit in front of the stage for the entire show, so please stop by and say hello! We'd love to meet you! We'll also be interviewing Jason and JT Hodges so stay tuned for the interviews to be posted a few days following the show! Let's have a great time! Be sure to head over to City Limits Saloon in downtown Raleigh after the show (ages 18 and older only) for the hottest after party in town with Marty the One Man Party from WQDR. The night may hold a few surprises! You never know who might show up! Your ticket stub will get you in FREE and if you're between 18 and 21, there is an extra $5.00 fee. * Venue itself DOES NOT HAVE an ATM on site. Some vendors take cards but bring cash just in case.